Last spring seemed to be my season of dog books. I read and reviewed both Puppy Love and A Dog’s Journey, both novels that, like The Art of Racing in the Rain, speak about the bond between a dog owner and their pet. 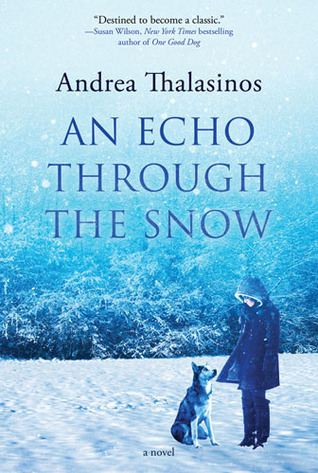 Andrea Thalasinos’ An Echo Through the Snow depicts a different kind of human/dog relationship by exploring the world of competitive dogsled racing. Rosalie is stuck in dead end jobs and a horrible life until she meets Smokey, an abused guard dog she takes under her protection. Being placed in a position of responsibility over someone else forces Rosalie to mature, and more importantly, leads her to discover a sense of purpose and a job helping a local couple train dogsled teams. The bond between Rosalie and Smokey is touching, but it’s interesting to see the difference in dynamic with human characters and the dogsled team. Despite the clear affection, the dogs are primarily there to be trained, and to work as a team, rather than to provide companionship to their owners. As such, there is less anthropomorphizing in this book, as well as more focus on the human characters’ stories. I found myself caught up in Rosalie’s story — painfully shy, troubled, and dealing with an abusive husband, Rosalie is a sympathetic figure, one who grows and develops through her experiences with the dogsled team. Apart from an unnecessary (in my opinion) plot twist, this storyline is well done, and one I think Thalasinos should have spent more time developing. Less successful, in my view, is the parallel storyline, of a Chukchi woman named Jeaantaa, Keeper of the Guardians (Siberian huskies), who lives around the time Stalin’s Red Army is about to invade her land and displace her people. This storyline had promise and a compelling beginning — Jeaantaa is dealing with the death of her childhood sweetheart and so devotes herself to her role as Keeper to her community’s dogs. The future security of these dogs, however, is placed in jeopardy, and she then has to fight to protect them. A promising beginning, but one that unfortunately failed to maintain the momentum. It may be because of the constant switching between story lines without any sense of real connection, such that it felt like I was reading two separate books put together in a rather slapdash fashion. Or perhaps I just found Rosalie’s storyline more interesting. Jeaantaa’s story just seemed disjointed, and less interesting than I’d hoped. I wish Thalasinos had developed the storyline in more depth and revealed more about the Chukchi people and how the community felt about the impending threat to their way of life. This could have been a rich, evocative historical piece, but as it is now, I just wish Thalasinos had done away with this storyline and focused completely on Rosalie instead. An Echo Through the Snow is a different kind of dog book, one that keeps the focus wider than the bond between a human and her dog. The Jeaantaa story line could have been more interesting, and the Rosalie story line definitely did not need that plot twist, but overall, an interesting read for dog lovers. This entry was posted in Book Reviews and tagged 50BookPledge2012, ARC, Fiction, Raincoast Books by Jaclyn. Bookmark the permalink. I see from your review of The Devil Colony that you’re a James Rollins fan. Have you read his latest, Bloodline? It also features a great human/dog relationship. I haven’t yet, but I’m looking forward to it!